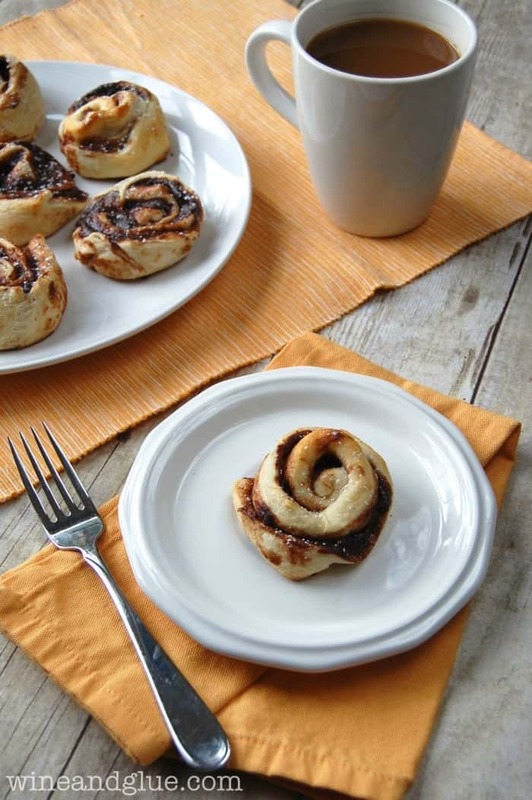 Pumpkin Nutella Rolls! 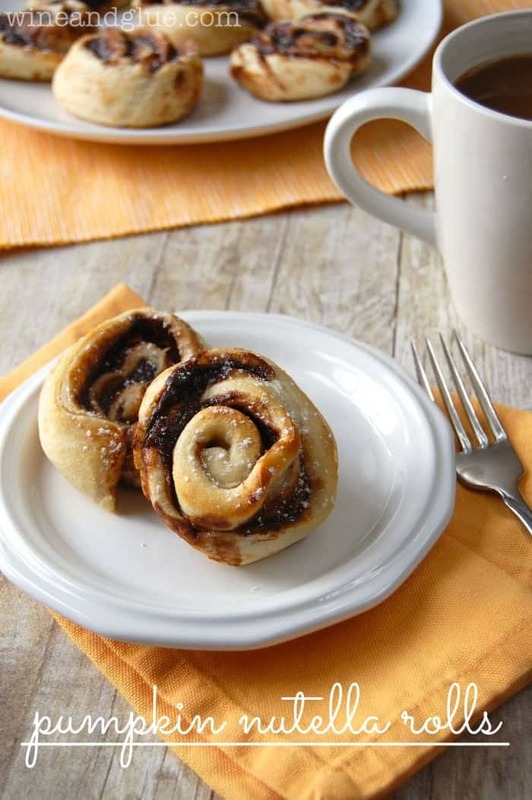 The delicious flavors of pumpkin and Nutella swirled together in a delicious pinwheel. Super simple to make and incredibly delicious! Can I tell you the sweetest story? So it was Quinn’s birthday, and we celebrated just our little family of four, and Nathan and I went way overboard with presents, because that’s how we are . . . and the following day we were having family over to celebrate. We were driving around in the car the day before, and talking about the next day, with everyone coming. All the sudden Gavin says, “Tomorrow everyone is going to bring gifts for Quinn?” And I told him yes, thinking he was probably wondering, in typical the world revolves around me five year old fashion, if there would be anything for him. Not only was I totally wrong about my kiddo (#momfail), he was being the sweetest ever. I so often underestimate my kids, and this was one of those moments. I underestimated his love for her and their relationship and how important it is. The next morning I took Gavin shopping before everyone came over, and lo and behold he picked out the absolute best gift for his little sister. Like all the other gifts immediately got put to the side so that she could play with the dog shaped guitar that her big brother got for her. I hope it is something that I never ever forget about Gavin. Guess what else is sweet?? These Pumpkin Nutella Rolls! They are sweet to eat and sweet to make! Three simple ingredients and it all comes together in like less than 25 minutes! The perfect recipe for a brunch or even an extra special afternoon snack for your super sweet kiddos! Spread out the seamless dough sheet. Whisk together the pumpkin and the Nutella and spread evenly over the dough. Roll the dough back up, starting what had been the middle of the roll. Place the roll in the freezer for 10 minutes. When you take the roll out of the freezer, cut it in half, cut those two pieces in half, and then cut those four pieces in half to make 8 pinwheels. 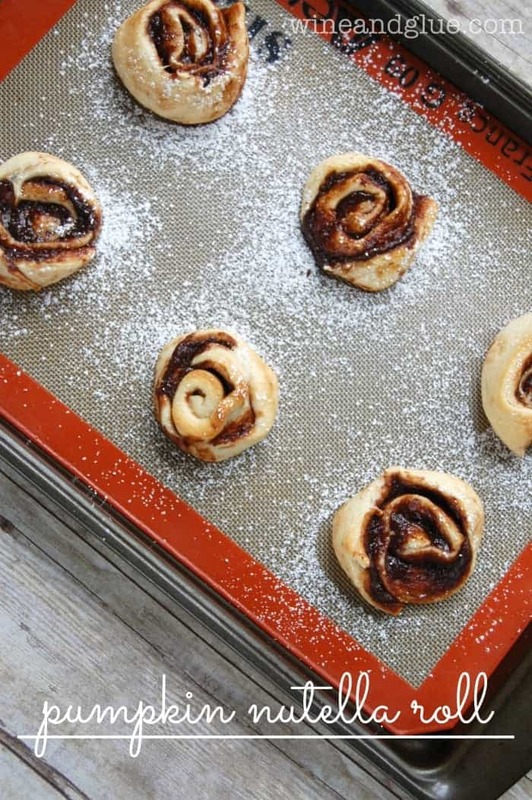 Place the pinwheels flat side down on a parchment lined baking sheet. Bake for 8 minutes. Let cool for 10 minutes and then sprinkle with powdered sugar. Aw, don’t the kiddos just warm your heart! Gavin sounds like a sweet boy!!! This recipe looks amazing and simple. Can’t wait to try them for brunch this weekend. Pumpkin and nutella sound like a wonderful combination!! SUCH a good combo, Nancy! Awww Gavin you have the biggest heart ever! You will make some lady a very lucky one in the future! Totally precious. Quinny is so lucky to have a wonderful big brother like you 🙂 These look amazing Lisa! Hahahaha! This comment gave me a good laugh. Thanks Jessica! I love knowing that my kids love each other and that they love to give! It’s a good feeling and it sound like you are doing a terrific job! You are doing a terrific job in the kitchen too! These rolls are dynomite! Oh my gosh…this sounds ridiculously good. I can’t wait to try these! Thanks! So easy and so good, Shannah! 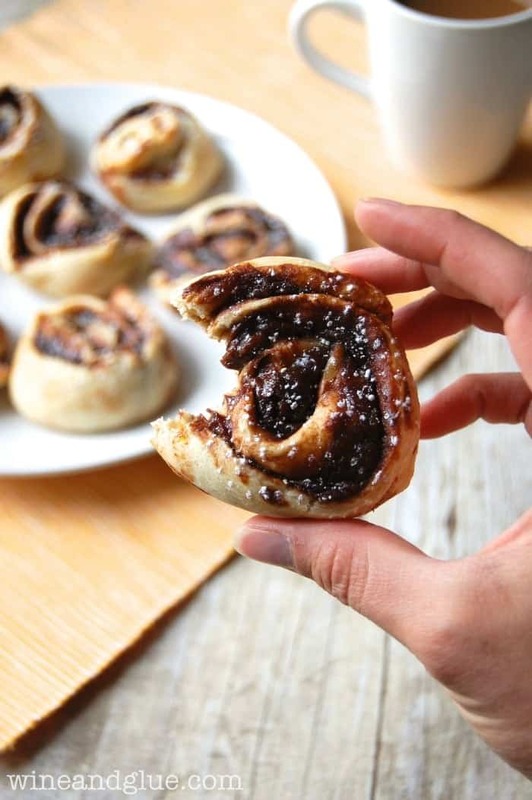 Pumpkin Nutella Rolls??? OMG! I WANT!!! !